After only six lessons, Mathilde Weil took up photography as a full-time profession in the late 1890s and established herself as a successful commercial studio photographer in Philadelphia. 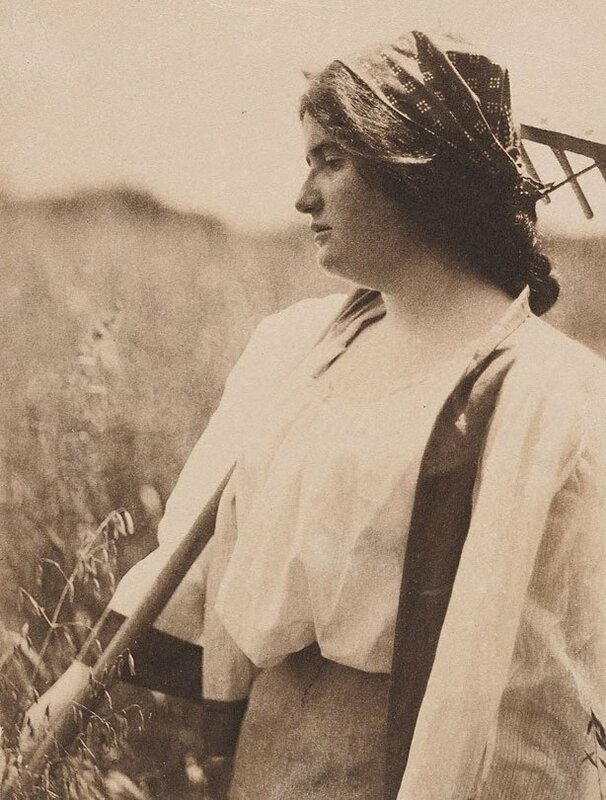 She was recognised as one of the leading artistic photographers of her day and in 1899 her work was selected for the ‘Portfolio of pictorial portraits’ which included other prominent American photographers such as Alfred Stieglitz and Clarence H White. She was also one of seven selected as ‘The Foremost Women Photographers of America’ whose work featured in the popular ‘Ladies’ Home Journal’ in June 1901. Weil attributed her earlier training in painting as influential on her photographic compositions, particularly in her treatment of light, pose and attention to expression. These artistic affects are evident in ‘Across the fields’ where Weil foregrounds the figure in high relief against the diffused features of the rural backdrop, providing a sharpened focus on her contemplative mood. ‘Across the fields’ evokes the genre of the rural worker in 19th-century painting, which is also alluded to in the photographs of Peter Henry Emerson. However, with an overall softened impression accentuated by high-keyed lighting, Weil translates the documentary elements of this tradition into an expression of poetically enhanced form.